If you are a business person, you definitely deal with lots of business cards of yours and of your partners. Old-school visit card holders are already obsolete, it’s inconvenient to carry all those papers with you. Fortunately, nowadays you are able to have everything on your smartphone and not worry about picking your wallet on the desk. 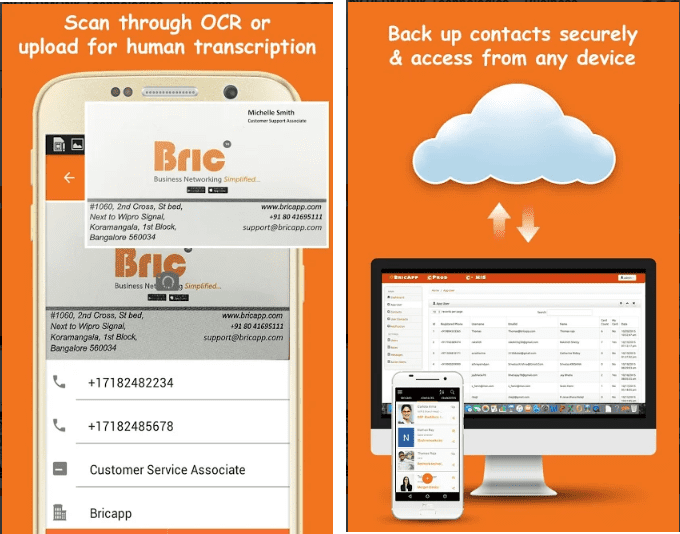 Business card scanner apps for Android and iOS are great for this purpose. You can just scan a card with your device and store as many of them as you need, you can organize and share them, and all these in one and the same app. 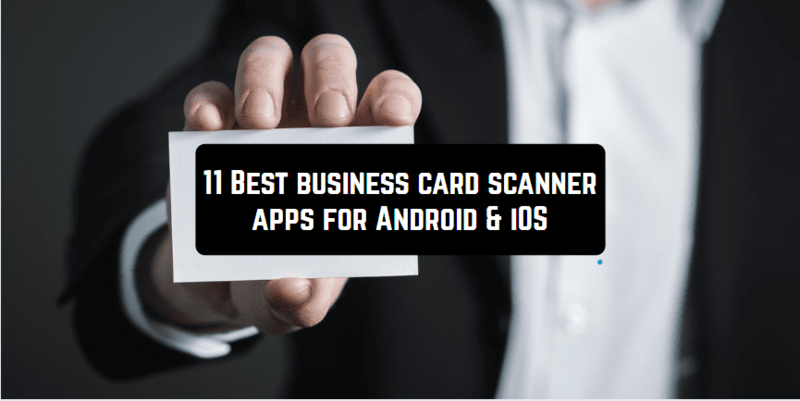 So, let’s take a look at the best business cards scanner apps you can find on the Internet at the moment. It is probably the most popular business card scanner app among salespeople available both on Google Play and AppStore. With this app, you can forget about carrying the cards with you, what is more, it provides a wide range of opportunities for interaction with your partners. You can easily scan a card using your smartphone camera and the app automatically pulls out all the data given. The app recognizes 17 different languages. If you need to exchange e-cards, you can use the same app. You can update your profile and let people you deal with know about you more. Moreover, being in touch with your partners, you are always aware of the most important dates, so you can always show you care about them. The app makes it possible to add your own notes and reminders to your contacts. Contacts are perfectly organized, the app can navigate them on the map. In addition, you can sync across all your devices. This very version of CamCard app is free, however, you can use Pro version as well. 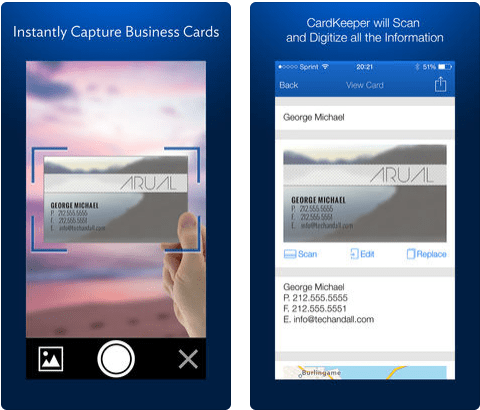 Another highly popular and very convenient business card scanner app is created by ABBYY. The app quickly scans and manages business cards, automatically creating new contacts with all the information given. This app works with 25 languages which makes it perfect for people who have business in different countries across the globe. It recognizes multilingual cards as well. The app provides simple contact management, you can sort and organize your contacts and add notes to them. You can sync the contacts across your smartphone, tablet, PC and access them on the official site. What is more, the app allows you to find out about your contacts on the most popular social network sites, such as Facebook or Twitter. You can also export the data to MS Excel if necessary. In addition, you can create and store your own business cards in different languages and exchange them when you need. So all the advantages listed above make this app one of the best, nevertheless, the free version provides only a trial period of usage. If you like the app, you will need to buy a full version after ten biz cards scanned. ScanBizCards provides easy and convenient business card management which will help you have all the cards perfectly organized. You can easily scan a card and store all the necessary data. 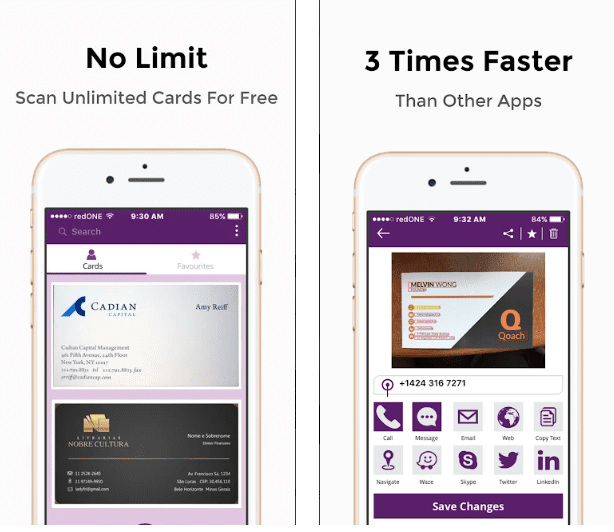 The advantage of this app is that the lite version allows you to scan and have an unlimited number of cards, so you will be able to enjoy all the benefits of business card scanning for free. The app recognizes 21 languages, including the eastern ones. 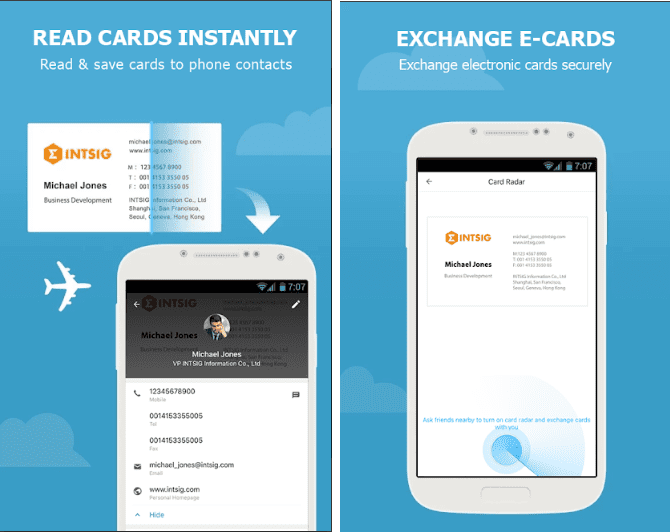 You can exchange the cards with your contacts. The app allows scanning double-sided business cards as well. A pleasant bonus – with this app you can organize your cards in a 3D gallery. BizConnect is an app for collecting business cards and keeping them all in one place. If you happen to forget important contacts or have troubles with finding the people you need, this app will considerably improve your life. With BizConnect, you can scan business cards or upload them from your gallery. The system easily recognizes all the necessary information, even if you scan several cards simultaneously. Once scanned or uploaded, the cards are securely stored in the app. You can share them or even export them to an Exel file. The greatest thing is that you can create your own profile in the app and search for other profiles of people that are near you. Vicinity search allows you to avoid the time-consuming process of scanning and, by the way, saves the trees. This app is perfect for storing your business contacts all in one place! It also has some other features that are quite useful and smoothly fit into the app’s style and theme. Get the app and try them right now. A very simple app for iOS users, which is not overloaded with unnecessary functions. You can easily and quickly scan a visiting card and store the necessary data. The app works with the most popular European languages: English, French, German, Italian, Spanish, Portuguese, Swedish. 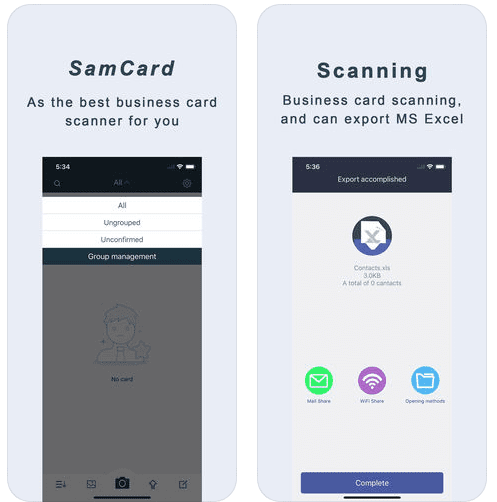 The app provides simple business card scanning, it automatically detects text orientation and has anti-shake photo shooting. You can organize the cards as you want. For using all the functions, the subscription can be required. This app is also perfectly simple. 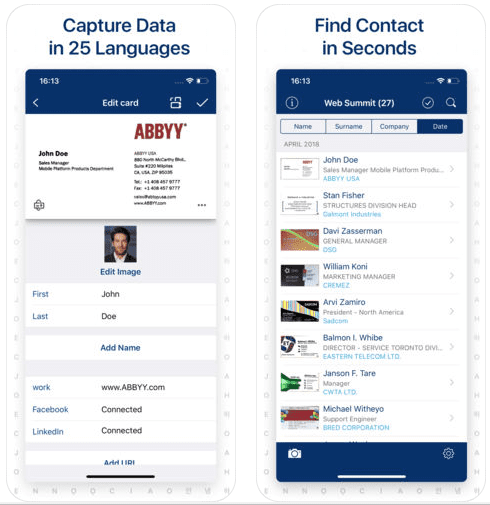 You can easily read a business card with your camera and the app will add all the data recognized to your iPhone’s Address book. All the basic functions, such as business card management and exchanging e-cards are provided. The app is light-weight, so you will not even notice you have lots of cards with you at the moment. The app provides all the functions which you may want to have, managing your business cards. You can scan them and store scanned and digital business cards in a convenient library. 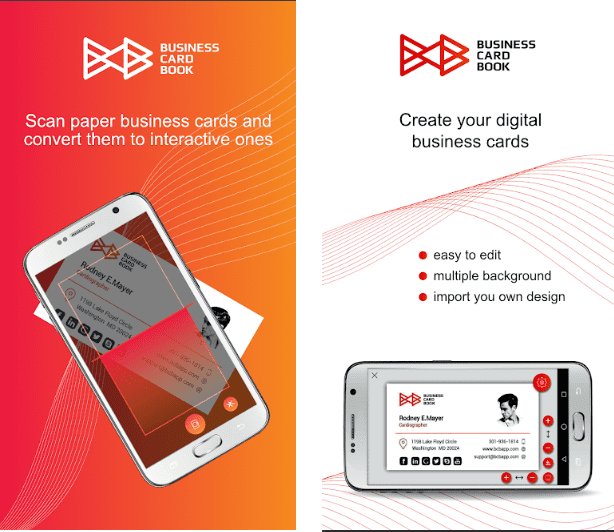 In addition, the app provides an opportunity to create your own digital business cards using a large variety of tools, colors as the app as a built-in editor. You will definitely like the way to personalize your data! This app has a large variety of functions and especially good for those who like all the data to be synchronized. 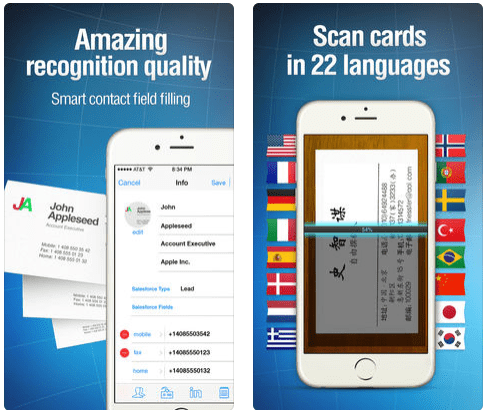 With this app, you can scan the cards in 22 European and Asian languages, store them, share them and export them in many formats. Business Card Reader is set with anti-shake image capture, so you will not spend a lot of time on scanning a card. A free version allows proceeding only a few cards, but you still can enjoy all the functions. This app is one of the best among free apps. It allows scanning an unlimited number of visiting cards and quickly and accurately proceeds the information. It supports 21 languages and may recognize multi-language business cards. A necessary feature – the app backs up the information in the cloud. Even though it misses some sharing and exporting opportunity, business people who like simple and fast apps will definitely like it. This app provides all the features needed to manage business cards. You can easily scan the card and the app will pick all the information accurately. The app provides various export opportunity and allows sharing of personal information, such as social network profiles with your contact. The system carefully backs up all the data, so you will not lose it at the wrong moment. You can access any card at any time as the app syncs across all your devices and can export business cards in many formats. 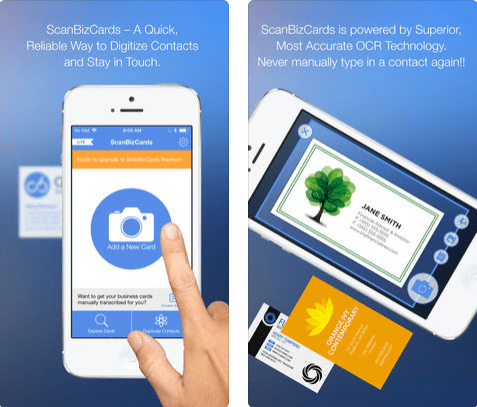 With these apps, you will never have to carry hundreds of business cards with you! Enjoy your life without worrying and do things that really matter.